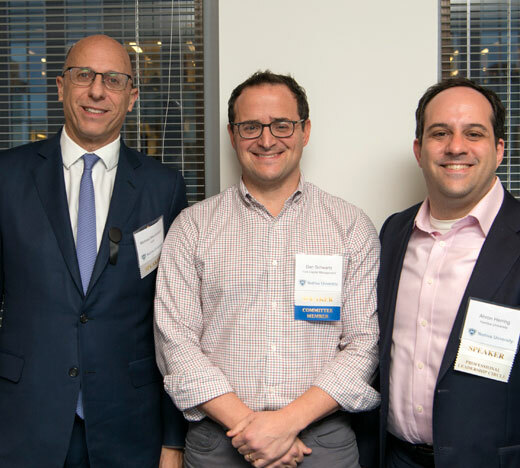 On March 14, the Yeshiva University Wall Street Group held a panel discussion on “The Evolution of Active Investment Management.” Hosted by DLA Piper, the panel featured Dan Schwartz ’88YC (Co-CEO, York Capital Management) and Michael Mendelson (Principal at AQR, a global investment management firm). Ahron Herring ’91YUHS, ’95YC, chief investment officer at YU, moderated the discussion. In response to questions from Herring, the panelists assessed the degree to which the increase in low- or no-fee passive investing by investors (through such vehicles as index funds or exchanged traded funds) and the algorithms of artificial intelligence have affected the investigative and advisory functions of active investment managers. Both agreed that where active management is effective is in helping investors with their portfolio diversification, and Mendelson noted that there was a still a need for the “idiosyncratic discovery” that a human mind can find and a machine cannot. In response to a question from Herring about what skills people need to navigate this changed world, Schwartz cited as crucial an understanding of computer programming along with some level of coding experience, while Mendelson emphasized that “common sense and the ability to talk to people” are as important, if not more so, than any technical training. In his concluding remarks, Herring observed that “there is often a messy transition period when new technologies are adopted” and that much of the current uncertainty is a sign of the industry going through the same disruption that other industries have been going through as they adjust to a new balance between machines and people.